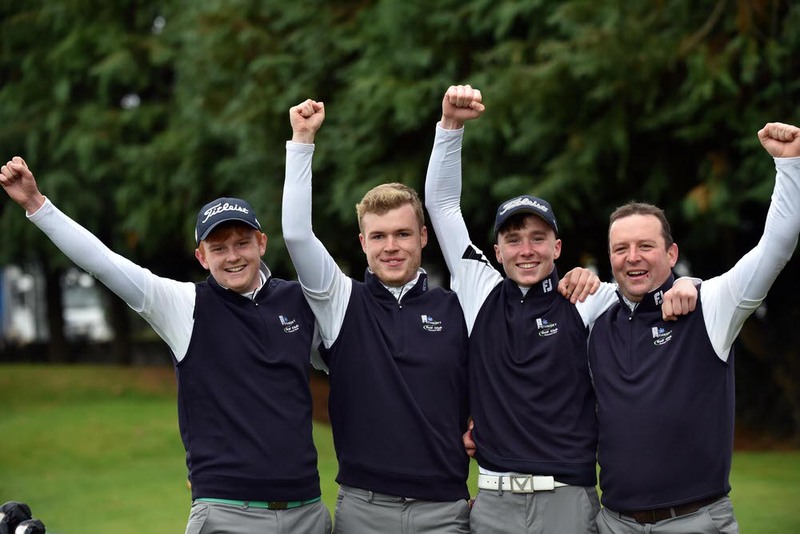 Champagne corks popped as Athenry beat favourites Dundalk by three holes to clinch the AIG Barton Shield and their first senior men’s All Ireland pennant at Thurles. Even without Boys international David Kitt, who is at the Youth Olympics in Argentina, a mainly youthful Athenry quartet was simply too steady for an often wayward Dundalk at the tree-lined Tipperary gem. 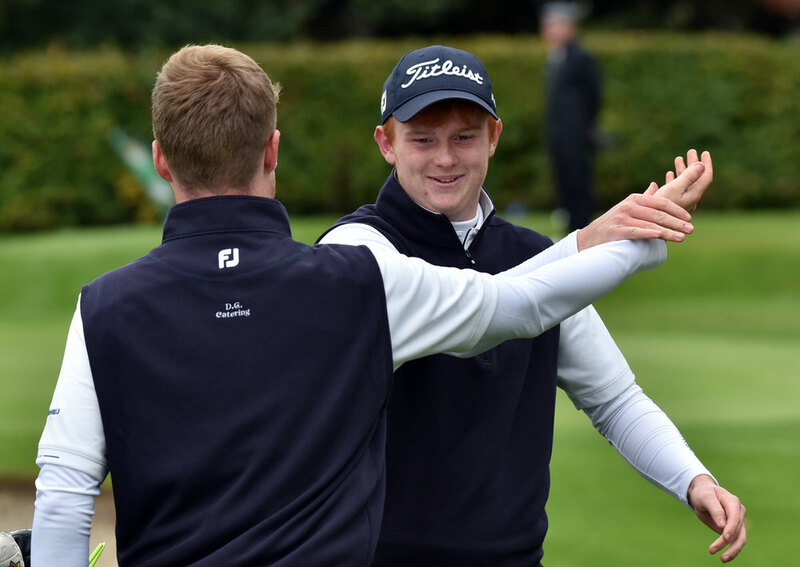 Louis O’Hara and Joe Bernie Jnr beat Aaron Grant and Conor Curran by four holes, easing the pressure on 16-year old Darren Leufer and 18-year-old Boys international Allan Hill, who sealed victory for Athenry with a par on the 17th. They were one down to international Caolan Rafferty and Eoin Murphy but having fought back from three down after five holes to be one up with seven to go, their rearguard action proved key. Grant and Curran didn’t hit a fairway between the fourth and the 13th and when O’Hara rattled in a 35 footer for birdie at the 16th to put Athenry three up, Dundalk simply ran out of holes. “It’s fantastic for Athenry and Galway golf," said Athenry captain Michael Lane as supporters broke into the Fields of Athenry. Bernie Jnr was the senior member of the team and he was the strong man for Athenry and a happy man too after two semi-final defeats in recent years. "I’m speechless and I’m not usually speechless," he said. "It’s the culmination of a lot of years of hard work I think for the golf club. This is the third time we’ve got to a senior All-Ireland and we’ve never won one and to do it today is absolutely magnificent. "I can’t speak highly enough of my partner Louis and our team captain Mike who has put so much into it, soldiered along for so many years. When you have talent like Darren and Allan and David as well, I think our day was coming. Today was our day." Young guns Leufer, O’Hara and Hill have benefited from Athenry’s youth system in recent years and the experience gained in the likes of the Fred Daly Trophy, which the club won last year, stood to several team members yesterday..
Hill (18) added: "We went down early today, three down after five holes and we stuck in there and tried to get a few holes back. But we got back to all square after nine and one up after 10. That was the turning point and then they came back at us with birdies at 15th and 16th but we put in a solid finish and made par to win. “It's a great club overall and the support we get is fantastic. Declan Cunningham was there until last year but Sean Whelan is the pro now." Athenry had won the 2004 Irish Youths, the 2008 Ladies Irish Challenge Cup and the Fred Daly Trophy in 2010 and 2017. However this triumph comes on the back of two All Ireland semi-final defeats in the Barton Shield in recent years and the celebrations were more than understandable. D Leufer & A Hill lost to C Rafferty & E Murphy 1 hole.